Have you ever wondered how a garment you're purchasing online will actually look on you? Estonian startup Fits.me has created a solution to that problem, creating a custom-built robot that can try on your duds for you, and let you see how they'll fit once they hit your door. The original FitBot rolled out last year for men, and now the company has launched a female version of the FitBot as well. Ladies can input their height, bust, waist, hips, and the measurement from their wrist to the back of their neck into the FitBot simulator, and see exactly what a piece of clothing is likely to look like on them. The technology can be used on any website selling clothing; however, the first site to pick up the technology is British retailer Hawes and Curtis. Fits.me claims that the FitBot can increase online sales by 57%, and reduce the amount of returned items by 28%. What do you think about the concept of the FitBot? 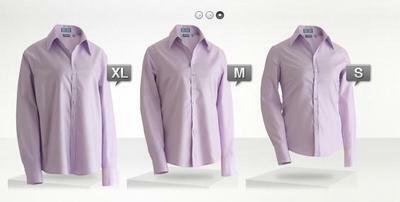 Would you input your measurements into the site to have it try on clothes for you?